I always wanted to cook a whole side of salmon but it seemed a little daunting. But after giving it a go, this couldn’t be further from the truth. 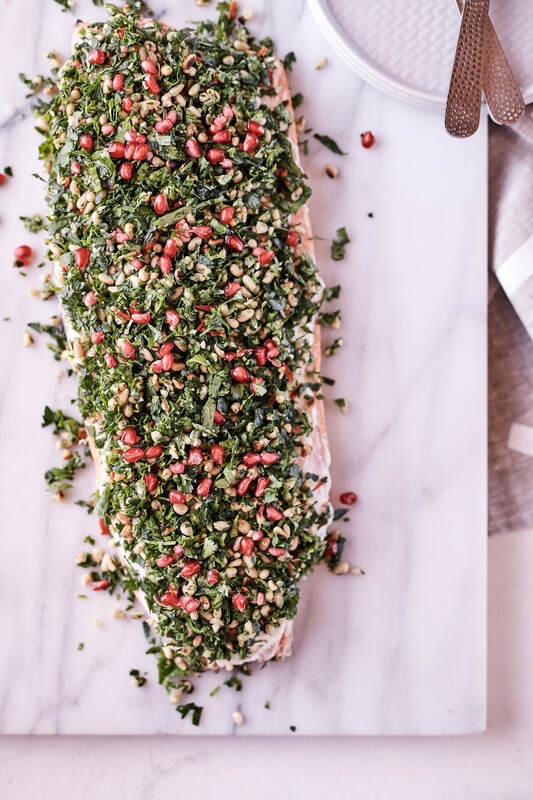 Baking a whole side of salmon instead is surprisingly simple and you can make this dish in about 30 minutes. I am all about fuss free cooking at the moment so this recipe ticks my box! Although I am not about to whip it out on a Tuesday night, it’s a impressive looking dish that is perfect to grace your table this long weekend for Easter or, later in the year, for Christmas. 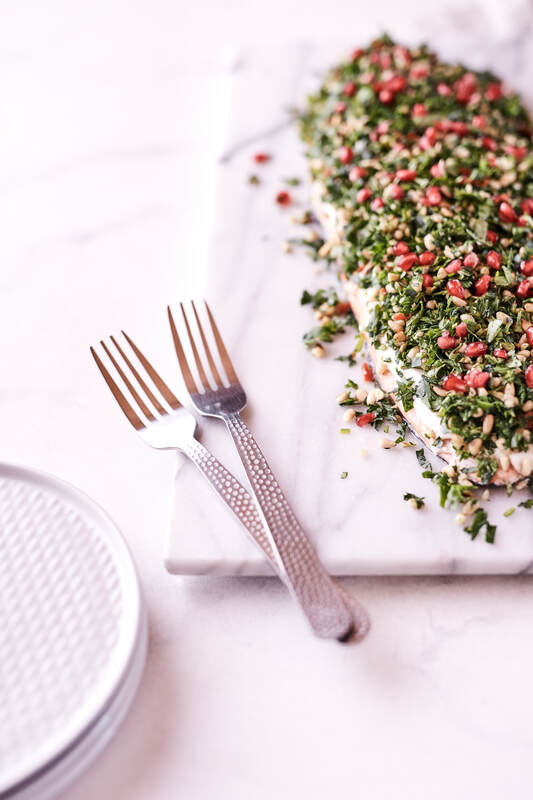 The forefather of Middle Eastern cuisine, Greg Malouf, inspired this recipe. This is kind of like his signature dish, but I have put my own spin on it. The addition of raw honey gives the yoghurt a lovely sweetness, just ensure to balance it out with a good squeeze of lemon juice. 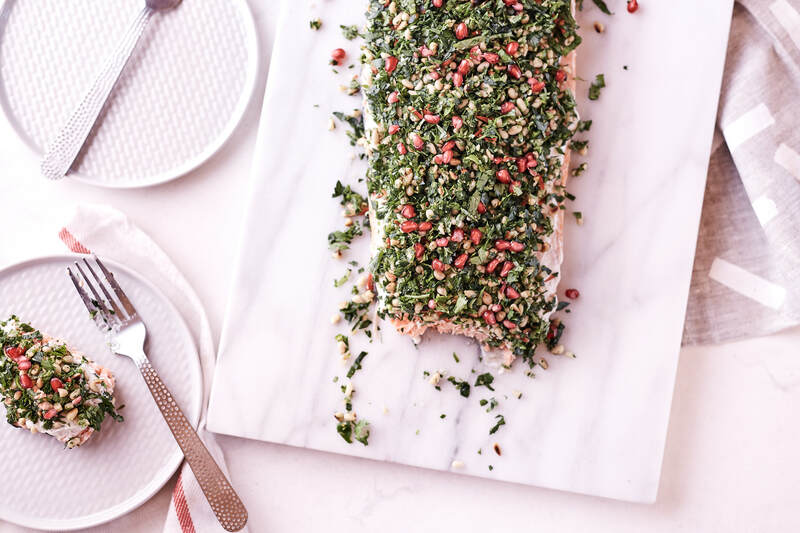 Pops of pomegranate and pine nuts with some fresh chilli also brings this dish to life! I wish you and your family a wonderful Easter, I hope you get a chance to wind down a little, enjoy the change of season and relax with your loved ones. And maybe doing something that seems a little daunting at first…! Prepare salmon by placing two large sheets of baking paper overlapping on a clean flat surface. Place salmon with the skin side down across the baking paper, drizzle with olive oil and season with salt and pepper then wrap the salmon up like a parcel, sealing the sides by folding them onto themselves. Carefully place wrapped salmon on a large baking tray and bake on one side for 12 minutes, then flip carefully and bake for a further 12 minutes. Turn off heat and pull the oven door ajar allowing salmon to rest for five minutes before removing from the oven. Mix together the fresh herbs, chilli pine nuts and pomegranate in a bowl and toss gently to combine. Carefully place salmon skin side down on serving plate or large board, then unwrap baking paper and scrape off any grey fat lines. 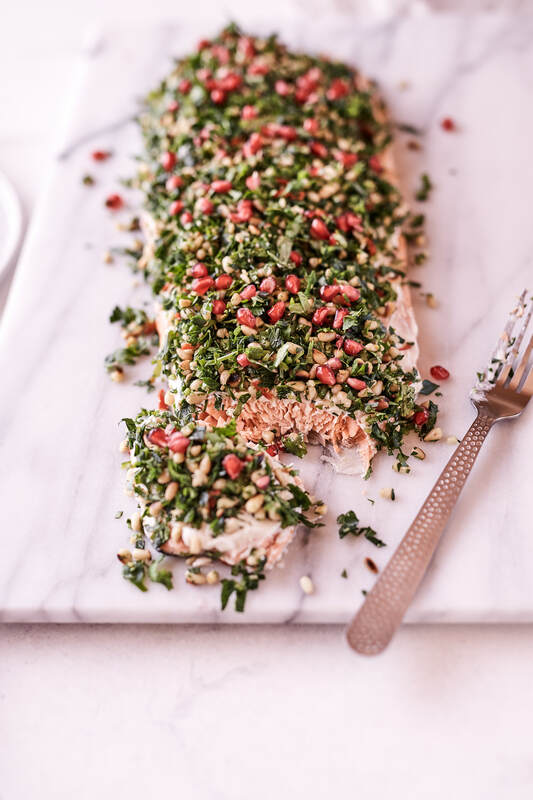 Smother salmon with yoghurt coating evenly then top with herb mixture then scatter extra pine nuts and pomegranates on top to garnish. Best served warm.